On Tuesday morning, the hosts of the morning news program ‘Fox and Friends’ tackled one of the Insane Inflatable 5K’s marquee obstacles, Pure Misery. Outside the Fox News studios in Manhattan, Steve Doocy, Elizabeth Hasselbeck, Brian Kilmeade and Maria Molina raced through the rain-slicked series of challenges as a way to celebrate the first anniversary of Hasselbeck’s debut on the program last year. The Insane Inflatable 5K isn’t your ordinary 5K race, which Fox and Friends discovered this morning! 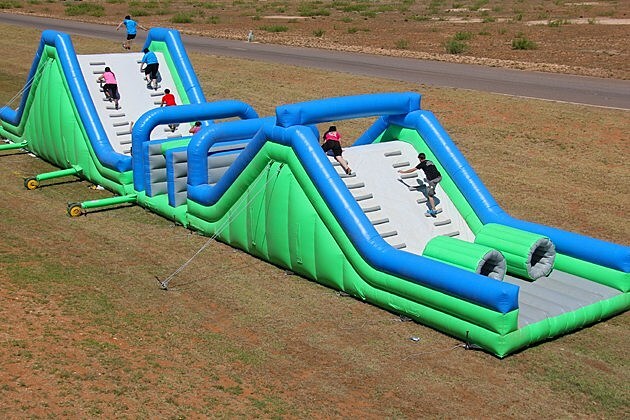 It’s entirely made up of giant inflatable obstacles, eleven in all, and is geared toward group participation. The race is not timed as it is more about having a great time with friends, family and co-workers. It’s a fun way to both get a nice workout and do some good old-fashioned group bonding with plenty of laughs along the way. The Insane Inflatable 5K plans to visit over 120 cities in 2016, and that schedule is available now. The events will take place all over the country, and it’s likely that one will be somewhere near you. Thanks to everyone that helped make our debut year a huge success and to Fox and Friends for a great segment on live TV!